The African Christian leaders regularly and rightly correct leaders and communions in Europe and the USA. Though Mao thought that the Cultural Revolution would destroy Christianity in China it has flourished despite (and perhaps because of) persecution. She’s right that Late Modern secularism is nihilistic and self-defeating. 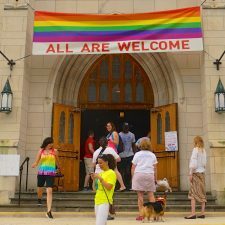 As we watch the LGBTQIA movement(s) fragment and turn on each other (e.g., the Q wing of the movement wants to subsume the others and the L wing is unhappy with the T faction) we should remember that there is a Christian way of understanding the world, which provides coherence, order, and meaning to life in this world. Further, she’s right that there is empirical evidence to support the notion that such a Christian understanding of the world has positive consequences for daily life. She is quite right to note the diversity inherent to historic Christianity. After all, the Christian religion, considered as a distinct historical phenomenon, began in the Mediterranean, spread to North Africa, to Europe, and eventually across the globe. Christ truly is calling his people from “every tribe and tongue and people and nation” (Rev 5:9).